“Happy and Gay” is a revisionist history document reflecting the form of a 1930’s-styled cartoon musical. This film’s goal is to be a “revisionist history” work, imitating the Hollywood cartoon of the 1930s. It’s main focus is aimed at responding to acts of censorship, prejudice and stereotype by re-placing a positive representation of gay and lesbian characters into a positively queer narrative. I think of this as a document that could not exist at the time it references because of dominant social, cultural, and religious moral codes of the time. The 1930’s American Hollywood Hays Code, in collaboration with the Catholic Church’s “Legion of Decency” were focused on limiting filmic representation in the name of “morality and good taste.” This activity enforced the erasure of a positive gay and lesbian presence. It was not just about being underrepresented, but was very much about not existing at all in any positive way. Depictions were aimed at profiling a depraved and pitiful creature that was ultimately punished for their unnatural life, and caused anxiety and frustration in their heterosexual counterparts. The role of revisionist history has both it’s negative and positive aspects. It is an attempt to re-make historical information for the purposes of engineering a desired change in the public awareness and understanding of a matter. It’s most frequently associated with an historical event or belief. At it’s most benign, it’s used to update older information in order to include new discoveries and ways of thinking. As a more active yet positive activity, information is added that helps to unveil information that had been suppressed. As a negative activity, it’s used to deny something existed or occurred. Stereotyped representation extended itself as the ubiquitous “Pansy” character, as well as reaching the various ethnicities, races, and and more. Comon targets in early American animation included the African American Black, Jews, American Indian, Western Indian, Middle Eastern, and Asian populations. This film embeds versions of these painful representations as a way to maintain a focus on the original truth of these. The intention is to draw attention to these stereotyped signifiers as real occurrences in the films of this era, including the stereotyped homosexual. While the film’s story is positive and entertaining, the story isn’t resolved and without its own original history. An example of my use of this kind pf stereotype can be seen in this shot. The Asian opium smoker was a common derogatory way of pointing at the Asian immigrant in America. 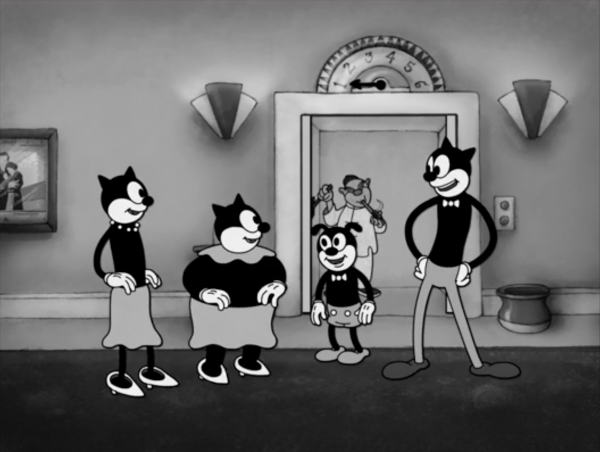 He appears in the background as an elevator operator. I found a particular style of representation of the “Pansy” character that appeared many times over with slight variations. It seemed to me that this character was someone specific, as it had such consistency. It turns out that character actor Tyrell Davis had the role of “Ernest” the dance instructor in director George Cukor’s “Our Betters,” 1932 (forgettable film.) There’s a bit of irony here, in that it turned out the Cukor was himself was homosexual. The laughable and ridiculous character of Ernest created a flaming “Pansy” replete with make-up, highly coiffed wavy hair, limp wrist and everything “effeminate.” This character had some kind of sharp affect upon some animators, because Davis, in this role of Ernest, became the queer stereotype across animation studios. This character’s appearance in my film “Happy & Gay” is rendered most closely to how he appeared in Ub Iwerk’s studio cartoons. Iwerks uses this character rather often, strangely. Take a look at this one, in which this leaping sequence is lifted from, and says everything about the negative portrayal of gays and lesbians in animation and film. Iwerks’ fame and fortune rose not so much from his own studio’s cartoons as it did from being identified as the animator that brought Mickey Mouse into existence, together with Walt Disney. This cartoon short by Iwerks, “Soda Squirt” (embedded below) is the most profound in how poorly it treats the homosexual character. Flip is a soda jerk at a fountain, he is flirting with the Hollywood star, Mae West, the epitome of female sexuality. “Ernest” enters, demanding a soda, and Flip’s masculinity is bothered and interrupted. Flip makes “Ernest” a soda that’s a toxic concoction, which causes him to metamorphosize into a monster. “Ernest” goes about attempting to destroy Flip’s business and to fight Flip. Flip manages to get him into the spray of a giant bottle of “Eau de Pansy,” where “Ernest” is magically transformed back into his Pansy identity. Ernest prances away, and Flip angrily slams his first onto the “No Sale!” tab on his register. This following clip is an excerpt from my film, using direct reference to Iwerk’s “Ernest” animation character as he prances out of Flip’s soda shop. Again, the intention of the “revisionist history” goal prompted me sometimes to embed explicit filmic references, such as in this reference.